To view the map feature on iOS or Android, click "Nearby" in the sidebar navigation. If this is your first time using this feature, you will be asked to allow the application access to your current location. By allowing the app to use your location, it will geolocate you and show pushpins for constituents in your area. If you do not allow the use of your location, you will need to search for a zip code/city/state, etc. in order to view a specific location. Note, allowing access to your location does not mean that other alumni will be able to see your real-time location. All maps pins are dropped based on addresses loaded your institution's database. On the web version, the map will be available on the main browsing screen and can be accessed using the toggle highlighted below. The map is also accessible by using the dropdown menu in the upper-right corned, "Find [Alumni]." This dropdown will contain several options, one of which is "Find [Alumni] Nearby." Q: Does the map feature use my real-time location? A: No. The map displays addresses provided from the main database. It does not display real-time location data. Q: How do I return to my current location? A: Click the arrow icon near the bottom left of the app screen. Q: How do I search for a specific person or location on the mobile apps? A: On your mobile device, click on the Filter button in the top-right corner of the map. You can also filter on other fields, such as Company, Major, and Year. 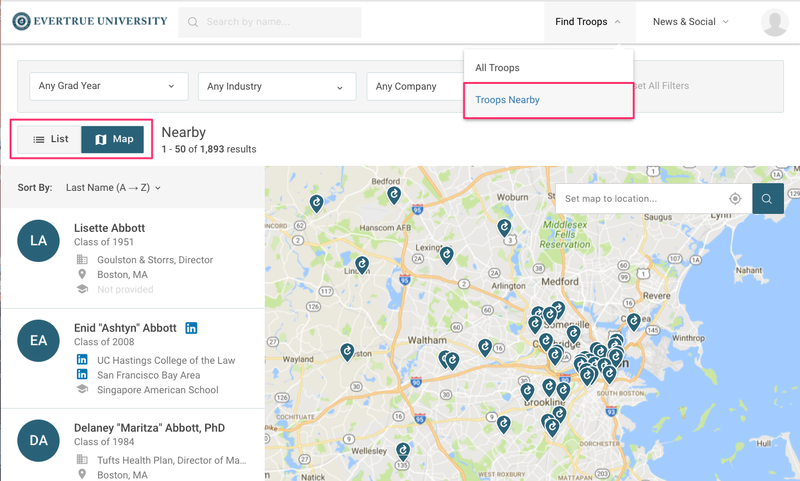 In the web version, use the filters to narrow down your results or the location search bar on the map to change locations. If you know the constituent's name, just type it in the main search bar near the top. Q: How do I access a list of constituents within a specific location? A: Search for that location and then click the List button in the bottom right corner of the map. This will bring up a full list of all constituents with pins in that location. On any map view, you will only see 50 pins drop at any given time due to screen limitations. However, the full set of results will still be available in the list view.